Ekiti State Governor, Engr. Segun Oni has described the death of former Managing Ditrector of Sketch newspapers; Mr. Peter Ajayi has a great loss to the journalism profession and the entire nation, urging journalists in the country to emulate the late media guru. Speaking at the burial ceremony of the deceased in Usi Ekiti, Ido/Osi Local Government Area of Ekiti State today, Governor Oni said the late Peter Ajayi would forever be remembered for the indelible marks he left behind after many decades in the journalism profession. “Today, we have gathered here to not to mourn but to celebrate the life of an epitome of the finest breed in journalism. Peter Ajayi and the other musketeers, Felix Adenaike and Chief Segun Osoba redefined journalism profession in this country and weaned it from the hands of the floatsam and jetsam of the society. “If one puts in perspective the quality of life that he lived, there is every cause for us to celebrate a man with virtues plated in superlatives. Peter Ajayi was in every sense an outstanding journalist of impeccable integrity, extraordinary competence, uncompromising discipline and stout professionalism. “No doubt, he is going to be missed by the State because he was one of the illustrious sons of the land who contributed meaningfully to the development of the country. “Our prayers in is that God in His infinite mercies would grant his family, friends and admirers the fortitude to bear this irreparable loss,” Oni said. In his sermon, the Officiating Minister, Rev. Dominic Ajayi lauded the good virtues of late Ajayi, stressing that the deceased lived a worthy life of integrity and honesty. The Cleric, who affirmed that death, was not the end of man, called on all and sundry to live a worthy life before God and man. He appealed to all illustrious sons of the State that are based abroad to come home and team up with the Oni-led government in its bid to bring lasting development to the State. 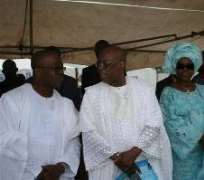 Apart from top functionaries of the State government, at the burial ceremony were former governor of Ogun State and a close associate of the deceased, Aremo Olusegun Osoba, former governor of Osun State and Action Congress (AC) national chairman, Chief Bisi Akande, Osun state Commissioner for Information, Alhaja Idiat Adejoke Aderinto, veteran journalists, Chief Yemi Farombi, Phil Aragbada and Felix Adenaike.